In the Valhalla of cinematic images, alongside Orson Welles grinning through one doorway and John Wayne gripping his arm in another, next to Mickey Mouse conducting a symphony of waves or King Kong hanging from the Empire State Building, there must be a spot for a black-cowled, white-faced Death leaning over a chessboard opposite a stoic Crusader, against the backdrop of a stirring dawn over a stilled, glistening sea, contemplating his next move. When recommending first Bergmans for neophyte viewers, I always lean toward Wild Strawberries, since its lush atmosphere and modern story seem, on the surface, to make it the most accessible entry point into the auteur’s oeuvre. Perhaps if I were more honest with myself, I’d select The Seventh Seal, which was my first Bergman and made a great introduction to his work. I hesitate for a few reasons: it’s grim and somber in its medieval setting, it could seem pretentious in its articulation of big, hefty themes, the emphasis on dialogue and the archetypal nature of the action and characters can make it seem too theatrical. Oh sure, I love it, but will someone new to Bergman? Yet these reservations tend to disappear on re-viewing, like the crusader’s depression on a brief sunlit afternoon. The film may be no picnic, but it’s hardly relentless misery – indeed, there may be more comedy than tragedy onscreen in terms of screentime. There’s intellectual wit, broad marital farce, lighthearted playfulness, and sardonic dark humor. This also cuts into the supposed pretension – when Death saws down a tree and an actor asks him what he’s doing, we’re confronted with the surprising immediacy of mortality, but we’re also chuckling (and we’re meant to chuckle) at the vague absurdity of the situation. The humor only adds an extra edge to the horror, makes it purer in a sense. Finally, there’s the old “theatrical” canard. This always makes me uncomfortable. On the one hand, I suppose it can be a useful cudgel – take for example a lot of contemporary indies which seem content to have characters talk amongst purposefully static and distanced camera set-ups. To call this “un-cinematic” can serve as a convenient articulation of frustration and a useful reminder of the fact that art doesn’t need to be boring. Besides, since the early talkie era (and perhaps even before that, with the static “Famous Plays” silent movie which seemed content to record a performance without making any attempt at translation) filmmakers have had to be on the look-out for a complacent use of the camera, an over-indulgence in the writerly instinct (which from personal experience I recognize) to sit characters in a room and have them talk out their problems. Fine for the intimacy of a theater, not so great when there’s a celluloid or digital wall between you and the live action, and other tools are necessary to bring the material to life. Yet at the same time, theater is undoubtedly one of the arts that informs film, as do painting, literature, photography, dance, music…to completely wall it off and be on a witch hunt against theatrical elements destroys a vital tool in the cinematic arsenal. Besides, there tends to be a bit of a double standard in how these rules are applied – as someone noted in a comment I read recently, the people who criticize Bergman for being “theatrical” rarely condemn Fassbinder in similar terms. I think ultimately what is “cinematic” or “theatrical” is hard to pin down in terms of technique; it’s more a matter of sensibility, manifested in technique to be sure, but in hard-to-pin-down ways. My Night at Maud’s, My Dinner with Andre, and The Mother and the Whore all - varying wide shots, mediums, and close-ups - film talking heads yet there is something fundamentally cinematic about them, something that just calls up the romance of sitting in a dark theater watching a larger-than-life screen (even if you’re watching them on TV at home). It could be the subtlety of the sound design or the naturalistic flow of the performances or the receptivity of the camera to its environments, making the silent scenery, inside or out, part of the action. Returning to The Seventh Seal, it isn’t just the preponderance of dialogue that potentially make the film seem “theatrical” – it’s the broadly-drawn character types and the way situations unfold, which seems drawn more from the spatial limitations and compressed action of a play than from movies. Well, it’s no wonder – The Seventh Seal was a play before it hit the screen, though Bergman may have already had the movie in mind when he produced it on the stage (I believe he did). Yet the richness of The Seventh Seal lies in the way it fuses its theatrical and cinematic heritage, mixing the wife and the mistress so to speak (that was how Bergman distinguished his two passions – married to the theater, lustily romancing the cinema). Yes, characters talk for long stretches and certain elements, like the bawdy confrontation between cuckolded husband and vain lover, seem more at home in a play. At the same time, the movie is expressionist to the hilt, in a way only movies can be, using close-ups, music, and especially lighting to convey a dreamy cinematic sensual experience. 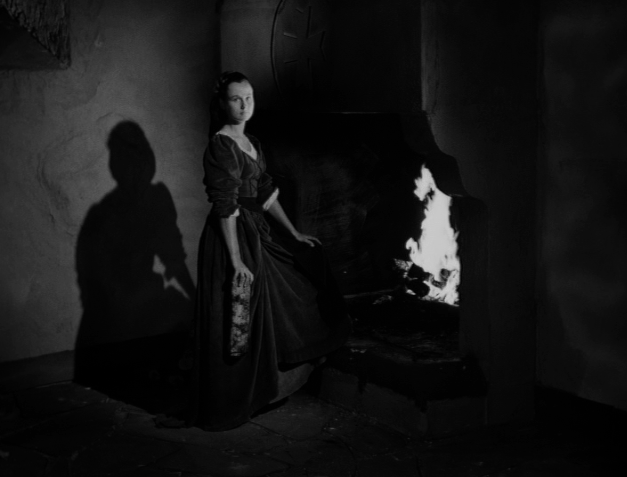 Later, in The Virgin Spring, Bergman would make something more purely “cinematic” and that represents a kind of growth, to be sure, but the detailed, loaded, information-heavy mise en scene and narrative (much like a medieval panoramic painting) has its own kinds of rich rewards. I love the boldness of this approach, and the iconic stature of the gestures, from a personified Death to a naively simple and contemporary (look at the clothing) religious vision to the desire to stuff in a bit of everything: witches, crazy cultists, crusaders, the Black Death, touring pageantry, tavern brawls, gloomy castles, moody wooded glens, sunlit fields, rocky beaches. The Seventh Seal is like a tour of the medieval imagination, limited in its parameters, crude in its scope, yet glistening with encrusted jewels and intricate flourishes. These bold, bigger-than-life touches also give the movie a kind of “cool” – it is intense and intelligent but, in a sense, not too sophisticated, which lends it charm. Like Persona, The Seventh Seal grows in its impression the more Bergman films you see, especially the ones that came before. Though he’d had a few smaller hits, like Summer with Monika (a huge influence on the French New Wave) and Smiles of a Summer Night (his first international smash), The Seventh Seal was Bergman’s true artistic breakthrough, the film that made him a legend and established his persona for audiences in Europe and America. Yet it was his seventeenth film, and watching the others before one gathers both a sense of accumulation and a real sense of surprise, nonetheless, to see all the elements coalesce so strongly as they do here. One thing I noticed watching the film in this fashion was that the actress who plays the crusader’s wife was Inga Landgré, the star of Bergman’s directorial debut, Crisis. There she played an innocent girl launched into the world, inevitably corrupted and battered around by reality. To see her here, standing by her hearth, not quite middle-aged but older and wearier than in Crisis, is to feel in a way we have come full circle, but in the sense of a spiral, looking down on where we were before. It’s a moving realization because, also like Persona, The Seventh Seal remains one of the key turning points in Bergman’s career. By casting the actress in this role, he is bidding farewell to the growing pains of his cinematic adolescence, a rich, rewarding, if sometimes stumbling phase, and launching into the period of his mastery. Oh, there will be pitfalls to come – some muddied experiments, a few half-hearted comedies, the misguided non-Swedish film here or there – but what heights! When the wife welcomes her crusader home, knowing that they haven’t much longer, when they read the apocalyptic Revelations and hear a knocking on the door, when Death dances off with them across the hill, it’s an end to be sure. But it’s also a beginning, and as the actors lumber off in their carriage, spared Death to face an exciting future, we are with them, just launching on a thrilling artistic voyage. Yeah, not a bad place to begin after all. Actually Joel I watched The Seventh Seal first and then Wild Strawberries and sort of didn't like or appreciate either of them. Then I saw The Virgin Spring and loved it. Then came Persona and loved that. 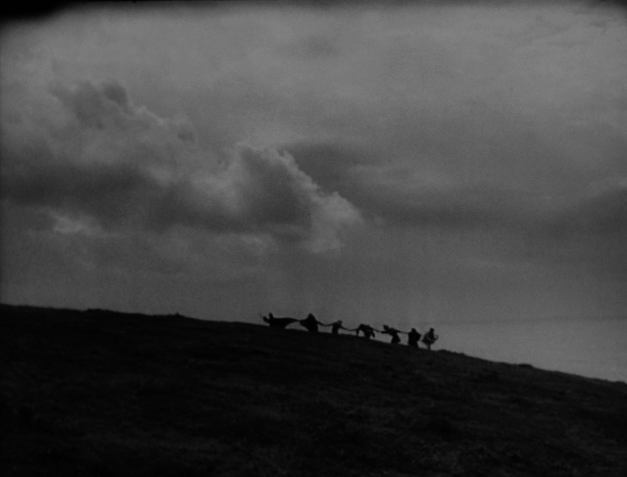 I came back to Wild Strawberries and The Seventh Seal again and really enjoyed them. I'm not sure why, but I found those to be initially rather oppressive and was not quite ready for them I guess. I've of course changed my tune and Bergman is my favorite director now 12 years after my initial discovery.